Welcome to United Flagpole - Quality flagpoles and flags at a value price. Quality flagpoles and flags at a value price. We believe that the best value may not always be the cheapest price. 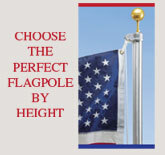 United Flagpole combines service and price to be your one stop flag and flagpole store. Our flags and flagpoles are manufactured in the U.S. We have customer service representatives with 25 years experience in the flagpole industry ready to answer your questions. ©2012 Design by SmartArt South, Inc.